Photo shows the top scholars with their parents behind them. Front row from left: Carl Dion Padua, Mariel Bautista, Samuel Daduya, Ma. Carolyn Sarinse, and Aaliyah Marie Bacsal. Back row from left: Itaas Elementary School Principal Raul Felix, DepEd TLE/EPP Division Supervisor Dr. Armando Romero, DepEd Science Division Supervisor Dr. Celia Espina, and Insular Life Sr. Manager and Production Services Head Maricel Gonzales. 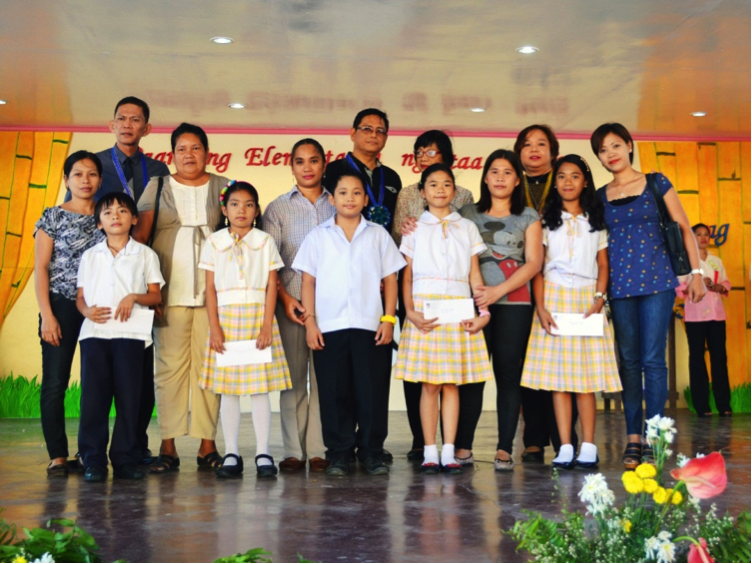 Six scholars of the Adopt-A-Scholar Program were awarded with cash prizes during the Recognition Program for students of the Itaas Elementary School in Muntinlupa City. The six are the top Grades three and five scholars of the Program. The third top scholars, Carl Dion Padua (grade three), and Even Grace Tapong (grade five), received P2,000 each. The second top scholars, Mariel Bautista (grade three), and Ma. Carolyn Sarinse (grade five) received P3,000 each. The top scholars for both grade levels, Samuel Daduya (grade three) and Aaliyah Marie Bacsal (grade five) received P5,000 each. The Insular Foundation was also awarded a certificate of recognition for its continuous support to the school through the Adopt-A-Scholar Program. The Adopt-A-Scholar Program is administered by the Insular Foundation but is voluntarily supported by employees of Insular Life, who commit to support their scholars until they graduate from grade school by donating a year’s supply of school supplies, a set of uniform, school shoes or bags, and storybooks. The Program’s 170 scholars are mostly children of prisoners, prison guards and employees, and parents who belong to the poorest of the poor in the New Bilibid Prison Reservation community.